Return to the experimental, psychedelic world of early Pink Floyd with Nick Mason's Sauceful of Secrets! 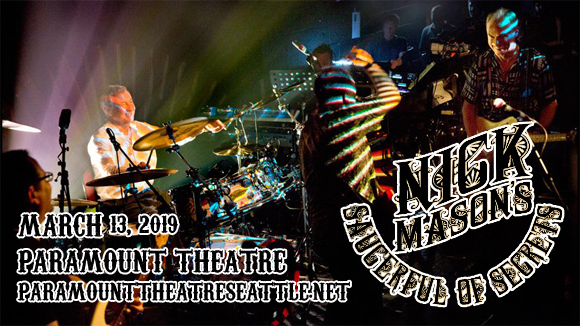 Coming to Paramount Theatre Seattle on Wednesday 13th March 2019, this nostalgia-tinged supergroup, featuring Pink Floyd drummer and founding member Nick Mason and, perhaps unexpectedly, Spandau Ballet guitarist and vocalist Gary Kemp, will transport you back to the days before the Dark Side, covering pre-1973 Floyd! Unmissable for any fans of Pink Floyd's early days! English psychedelic rock band Nick Mason's Saucerful of Secrets was formed in 2018 by Pink Floyd founding member and drummer Nick Mason and guitarist Lee Harris. The group also consists of Gary Kemp of Spandau Ballet on guitars and vocals, and longtime Pink Floyd collaborator Guy Pratt on bass, and aims to "capture the spirit" of the early music of Pink Floyd. The band performs covers of early Pink Floyd songs, and made its live debut in May 2018 at Dingwalls in London with a selection of pre-1973 Pink Floyd material. Nick Mason's Saucerful of Secrets will tour throughout 2019, drawing from the Mason-curated Pink Floyd boxset The Early Years 1965-1972 to compile their set-lists.